Above, The Pink Studio’s Natalie Borch. The Pur Yoga studio is seen in the inset photo in the story. Photos: Submitted. There are several innovative yoga studios around the Beach that welcome those of all skill levels and ages. 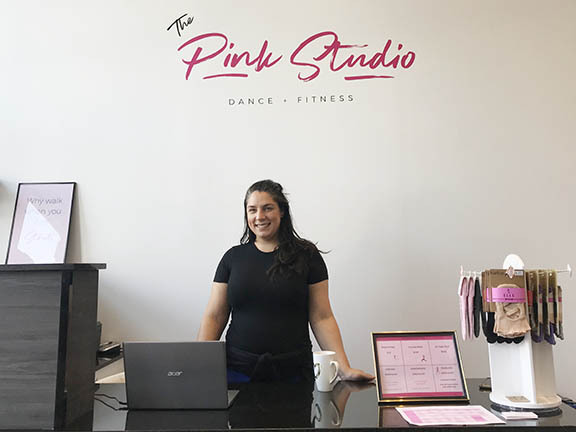 The Pink Studio, a yoga, dance and fitness studio at Woodbine and Danforth Avenues, is one of them. South African natives Natalie Borch and brother Grant Van Rensburg opened their family-owned location in February 2018 and offer a range of classes such as Vinyasa- style beginner yoga, Pilates and ballet. Natalie, who has been in the Beach for 10 years says “a lot of the idea behind the studio centres around empowerment and inclusivity. What’s important to us is to have a place that is body positive. Growing up as a dancer, the [dance] community can be very non-inclusive but we are very welcoming and LGBTQ positive, as my brother is a part of the community,” she said. “The pink may give off a women-only vibe but men are definitely welcome as well,” she said. The studio also has a boutique with apparel that goes up to XXL, and it’s from a Canadian wholesaler. The Pink Studio is for beginners, especially its yoga classes where it may be intimidating to dive in—these are warm, paced classes for people who want to try yoga for the first time and are hesitant. You can visit drop-in classes for $15 or buy a membership to join eight classes for $84 a month. Liz McGregor is another local business owner, having just celebrated her second year of operating Pur Yoga studio on Queen Street East between Hammersmith and Wineva avenues. The name ‘Pur Yoga’ conveys McGregor traditional approach to yoga, so the classes do not tend to focus on power or hot yoga. “The nice thing of having a smaller studio is the ability to give focused attention to individuals in a small comforting space,” said Liz. Pur offers Vinyasa, Iyengar, Yoganidra, a TRX Program, Thai Yoga massage and much more. She is happy the class is successful; her son Graeme also participates with his friends from hockey. 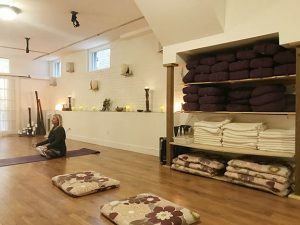 Both studios have attentive beginner programs for those in the community who are interested in building their confidence towards a balanced yoga education. And the new year is the perfect time to change up your routine and try something new to nourish your soul.